a thoughtful blog: little notes are thoughtful . . .
little notes are thoughtful . . . Whenever I send out a card or letter lately, I like to include little business card-sized notes in the envelope along with it. It's kind of like including a little gift in with the card--something the recipient can hold onto and use as a bookmark or tape up as a reminder somewhere (I stuck a few strips of washi tape to wax paper and included that with the little notes as well). The notes were typed out on my typewriter and embellished just a little with a hand-drawn border and a ribbon stamp. It's fun to add a little something extra to the envelope--and it's always nice to have encouraging reminders, I think! Have you sent any cards or letters lately? If you are up for a challenge (I know prolific mailers out there who would not consider this a challenge, but . . . ), the 52 Weeks of Mail group on Facebook has started up again with another 52 weeks. I tried to follow along for the last 52 but fell off the wagon sometime this summer. There is nothing magical about sending a piece of mail once a week, but I think that's a very reasonable/doable goal. I hope to send more than that! Amber, I have followed 52 weeks of mail on Facebook for several months and have "committed" to following them for the next 52weeks. This week I have sent three snail mails! I love sending and receiving snail mail. I also like to include little enclosures ( I call them random oddities). I would love to drop you a note in the mail. What is the best way for you to get me your address without the whole world seeing? Donna, that's great! We'll be following along together, then. :) And I am always up for good mail--I will email you. Thanks! Amber...these are lovely! 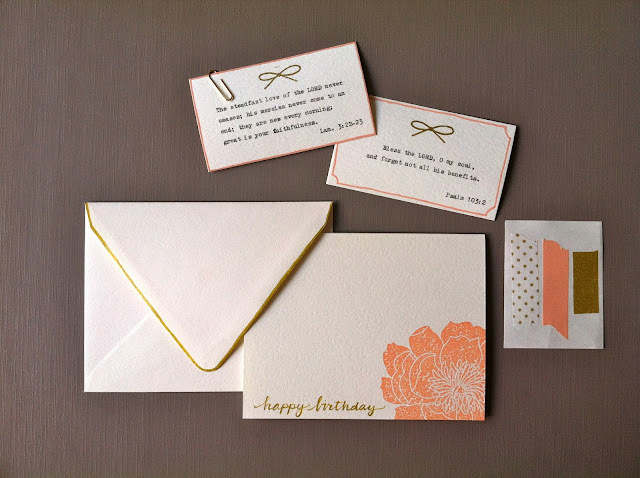 I love the idea of the little cards and who doesn't want some extra wash tape?! Snail mail is definitely thoughtful. Thank you for that reminder!